Adaptive cruise control started out as a feature only for luxury cars – and the people who can afford them. The technology uses sensors that monitor the car in front of you at all times, adjusting your speed automatically. On the highway, if you set your cruise control to 65mph, but the traffic speed is more like 55mph, your car will match the traffic speed. When you use adaptive cruise, you can also set the gap distance from close, medium, or far away. Originally, adaptive cruise used sensors that were far too expensive for lower priced cars. In recent years, it became more common on mid-range cars, like the Ford Fusion. I remember testing adaptive cruise on several Infiniti, BMW, and Mercedes-Benz models when it first came out about seven or eight years ago. 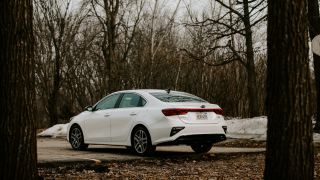 I’ve now seen this safety and convenience tech on much more affordable cars, including the 2019 Kia Forte I tested this week, which costs $17,790 (about £14,000, AU$25,000). I’m now convinced it should be standard on all new cars. Similar to the back-up camera, which the US National Highway Traffic Safety Administration started requiring on all new cars built since May 2018, adaptive cruise is a no-brainer as far as a safety feature. I realized this while testing the Forte. In one instance, driving on the highway with no cars in front of me, I set the adaptive cruise to 60mph. I was talking to my wife and looked over at her while we were making plans for later in the day. A car pulled out in front of me far ahead, but the adaptive cruise control kicked in and the Forte started slowing down gradually. In other cases, adaptive cruise control (or ACC) – which seems mostly like a convenience feature so you don’t have to constantly speed up and slow down – is also a major safety aid. In a traffic jam, you won’t always notice when the car in front of you brakes suddenly. It didn’t happen in the Forte, but in other tests, I’ve noticed how the ACC will kick in suddenly. The issue is that we can’t be 100% aware of traffic at all times. One of the best commercials I’ve seen that demonstrates this is from Audi that shows automated braking. It don’t show it specifically in the commercial, but we’ve all been in situations where you look down for a split second at coffee spilling or look back to see a kid crying and that’s just when a car pulls in front of you. ACC is a major safety feature hidden in the guise of a convenience feature. As automations in cars progress even further, we’ll rely on ACC more and more. And, if it becomes standard on all new cars, drivers will become more accustomed to relying on the sensors to help them, even when they take their hands off the wheel more and more. Even more important, as cars connect to intersections, road signs, other cars, and the infrastructure in general, ACC will become even more important. It’s the key technology on the road to fully autonomous driving. It means every car will be equipped with the sensors needed for automated driving. And, the costs are obviously low enough for even entry-level cars. There is a long way to go, however. Many trucks and rugged vehicles like Jeep Wranglers sometimes do not have ACC, and the truly budget-priced cars that cost only $13,000 (about £10,000, AU$18,000) or so like the Chevy Spark often do not come equipped with ACC. It’s also typically an upper trim level add-on. Automakers, my challenge to you is to make ACC available at all trim levels, and on all makes and models. It works.